Our Valentines class was very popular last year, so we’re doing it again this year. Attached is a pix of the 3 cards I’m doing; Kat is doing 3 more, so each of them will have 6 handmade Valentines to send to loved ones and friends. These have to be “quick and easy” cards, so we focus on a lot of pre-cut dies, embellishments, etc. rather than extensive stamping, coloring, techniques, etc. 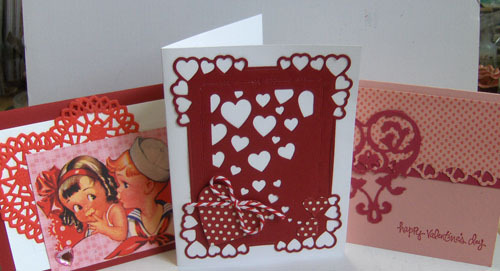 It’s really fun to see how some of the girls still use what we supply, and make the cards “their own”!! This is such a fun and rewarding time with the girls. They are all experiencing miracles in their lives, as they overcome life-threatening situations to truly become “who they were meant to be”. We love them . . . and Mercy!